Ditto, the texture write up: While these Crisps were thicker than regular Crisps, the rigidity replaced thickly sliced potato mushiness. The hardened oil saw the Crisps crunch crisply throughout the eating process. 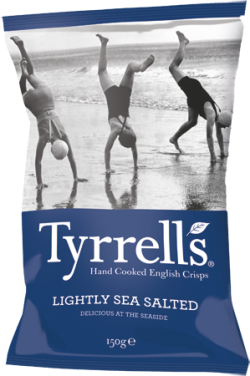 We tested the naked variation to this theme and as Tyrrell's provided pretty much the same Crisps, we will provide the same review: These Crisps were curly and bendy, which is a familiarity of Kettle Cooked Crisps. There was also a lot of skin on edges. The major feature however, was the very pale yellow colour of the Crisps appeared soaked in oil. Fortunately we do not need to repeat the write up of the No Salt variety because although these were rather limited in flavour, the addition of Salt, however little (and there was little), brought the flavour of the oily potato to the fore. It was all still a it too greasy and oil saturated for our liking, but at least the flavour was what it said on the front of the bag.